The Delhi Walla was one afternoon taking a stroll in Kinari Bazaar, a congested market in Old Delhi, famous for its wedding stores and street food. Reaching a turning, I found an incredible sight. A tall white woman was seated at a hole-in-the-wall eatery. She was serving kachoris and aloo-subzi on leaf bowls to customers. Dressed in a dark-blue short skirt, white blouse and light-blue jacket, she looked like an airhostess. Her uniform was a novelty to the Kinari Bazaar crowd, where women dress more traditionally. “More spices?” she asked each customer. If they nodded, she picked up chopped green chilies from a platter – with bare hands – and sprinkled them on the subzi. The woman was polite, smiled frequently and was making each person feel special. She ladled the gravy with great caution. A little later, the woman realised that she was hungry herself. Standing in the middle of the busy street, she took the first bite of the food she had been serving. Her eyes immediately watered. “I’m from Finland,” she said. “And I’m not used to Indian food. It’s so spicy.” I asked if she owned the stall. “No, no,” she said. ” I work in Finnair. I’m here because a family member of this kachori shop works with me in the same airline. I want to compare the feeling of working in a shop in Old Delhi to that of working in an airplane.” Then she started to wipe off the water from her eyes. It was a beautiful moment. Now, you are an eager boy! Who is this lady? 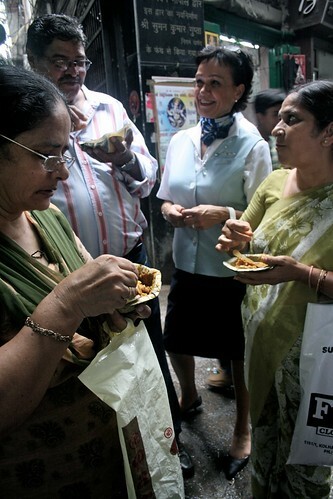 Is she the stall/shop owner or just a foreigner amusing herself trying to be a chaat walla(i)? I was at THIS VERY SHOP Todayyyyyyy!! Mayank dear should give precise location of food shops you discuss. Moreover, detailed map of Chandni Chowk is not available anywhere. Can anybody do something about it. to be precise its only 2mins walk from parathe wali gali. address is: 1104 mailwara, chandni chowk, delhi-6. This lady from Finland (Scandinavia) seems to have a past connection with India.. It seems she has been distributing Kachories for a long time.. 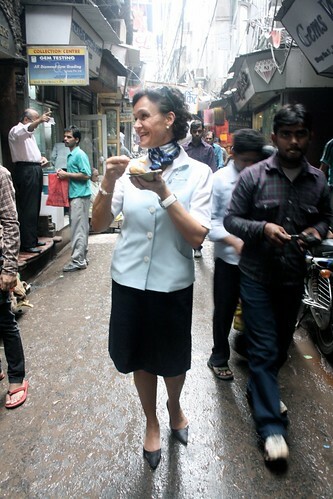 Hats off to her for admiring the culture and spicy food of India..
Good to see such an act of affection and warmth from her for the people of Sadar bazaar..